Olli Olli was a fantastic smash hit, coming out of the blue and unlocking the skateboarder that was apparently dormant in many of us. Developers Roll 7 is back for more, but with a somewhat different beast. 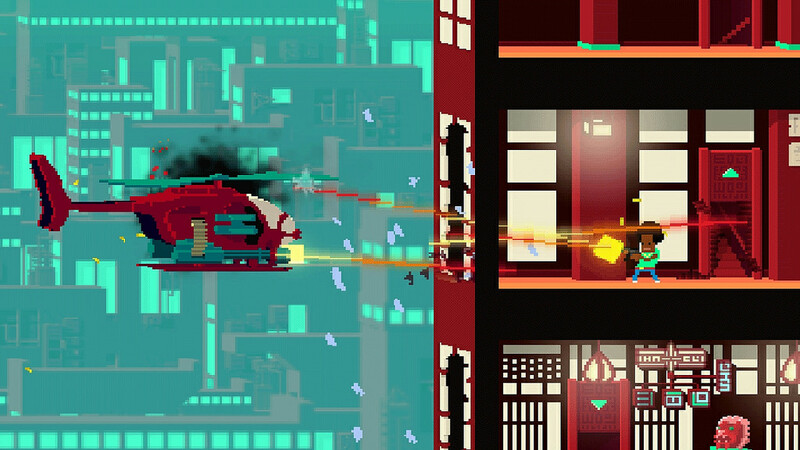 Not a Hero brings an oddly unique two and a quarter cover based shooter. You read that right; they’ve discovered a sweet spot somewhere between your more typical 2D and 3D. While wizards when it comes to popping ollies, you’d be forgiven for not assuming their next release would concern a time travelling rabbit overlord. Well, Not a Hero is very much focused on just that. The aptly christened Bunnylord has warped out of time and space to run for mayor in a bid to gain power and save the future. Although his goals may seem noble, Bunnylord is in fact a foul-mouthed bigot that gives many politicians in today’s media a run for their money. His methods are even more questionable, with his quest for mayoral status being fulfilled through the aid of several hitmen for hire and their murderous abilities. That’s where you come in. 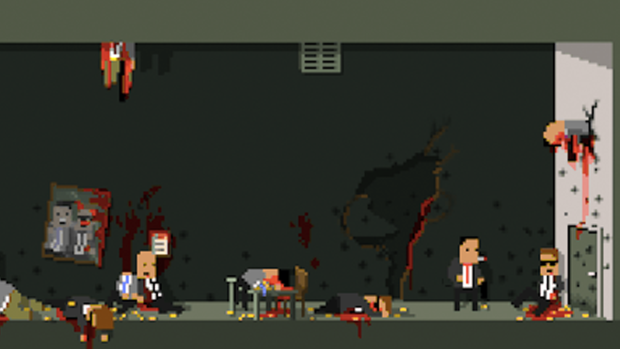 It’s your task to pick off individuals that are seen to impede Bunnylord and his mission for office. Fulfilling your contract can be achieved in a brilliantly non-linear fashion, with your objectives coming into sight via a number of optional routes. You’re also able to dictate your approach, either opting for a gloriously gory path, blasting away your pixel-based foes or by taking a more stealthy approach. The latter proves the most attractive, not least because it shows off the “ISO-Slant” technology the best. This is the bit of tech Roll 7 has utilized to reach the void found between two and three dimensions. This gives Not a Hero an exceptionally unique perspective that couples brilliantly with its pixel art style. It also plays hand in hand with the cover mechanic, making the stealthier approach far more functional. It’s no Uncharted when it comes to cover, but it certainly changes things up and makes you think twice about your next move. While going in shooting first and thinking later will reward you with a spectacular shower of red blocks, it’s also bloody difficult – pardon the pun. The slower and more covert method yields more success, but also produces a handful of complaints. When attempting a stealthy approach, it’s more annoying when you accidentally roll into your enemy’s shins rather than duck behind a slice of cover. It’s odd, then, that both the roll and cover mechanics share a button. While Roll 7 probably didn’t see the issues here, you probably will with the mishap upsettingly ruining many a sneak attack. Picking which mercenary to hire to aid Bunnylord is a fun affair, as each possesses a distinct array of abilities that compliment play. They’re little twists and improvements on the basic control scheme, such as increased movement speed, but add that little dash of variety that’s usually welcome but actually unnecessary in such an otherwise stimulating romp through town. Peripheral secondary objectives are often present too, much like its predecessors skillful tasks, and play on things like bullet consumption and object retrieval to cause thought for more than just blind murdering. These provide basic yet enticing reasons to dip into the pixel storm post-completion, simple and effective. The art style is undeniably great and suits the subject matter and quintessentially British humor admirably; each level providing little intros that prove even more hilarious thanks to their pixel representation. It doesn’t seem to feel wholly right on the PS4, however. The functional platforming and ISO-Slant weirdness certainly plays well on the console, but would feel phenomenal as a Vita release. This is, of course, in terms of play rather than developmental limitations and, as it happens, we’re lucky to even have received Not a Hero on anything other than a PC as the technology involved was never intended to operate on a PS4. 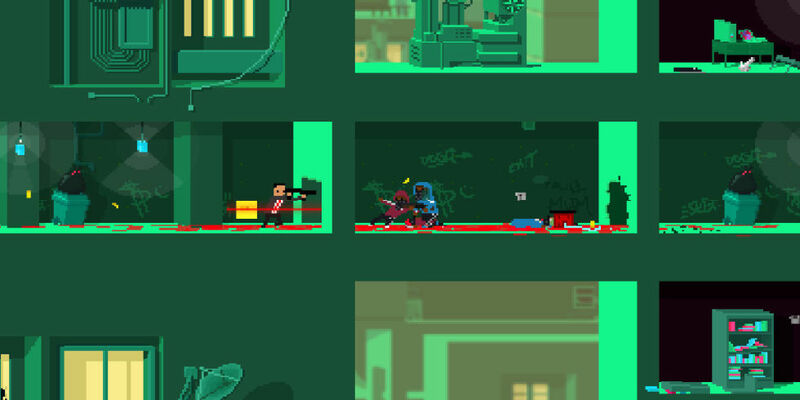 Not A Hero is a thumping good shooter experience made all the more exiting through an intriguing art style; unrelenting gore and a relatively non-linear composition to pleasantly fleshed out levels. The humor, while likely to grind on you after a while, is rib tickling for most part. Its overall tenure is brief, never staying long enough for you to think too deeply about aiding a burrow-digging politician in murdering party opposers to gain power, and rightly so. While it won’t have you mercilessly addicted to knocking out kickflips, it’ll likely be one of the best 2 and a quarter shooters you play this year. Not a Hero review copy provided by publisher. For information on scoring, please read our Review Policy here.